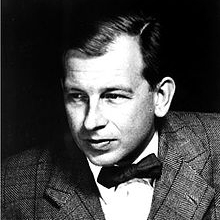 Eero Saarinen, was born in 1910 in Finland and in 1923 the family emigrated to the US. 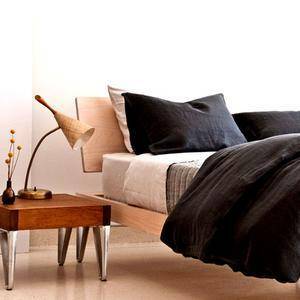 He studied architecture at Yale, graduating in 1934. A Yale scholarship enabled Saarinen to travel to Europe but he returned to the US in 1936 to work in his father’s architectural practice. When his father died in 1950, Eero Saarinen took over the practice. Saarinen taught at Cranbrook Academy where he met Charles Eames in the late 1930s. Experimenting with Eames, Eero Saarinen co-developed new furniture forms and the first designs for furniture made of molded, laminated wood. 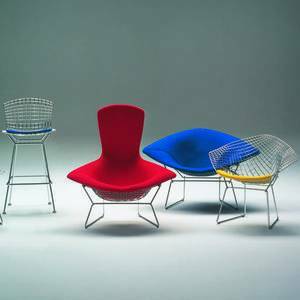 In 1940 Saarinen and Eames took part in the “Organic Design in Home Furnishings” competition mounted by the Museum of Modern Art in New York. For Knoll International Saarinen designed a great many pieces of furniture, including the 1948 Womb Chair, which was designed to make those seated in it feel as secure and cozy as a fetus in the womb. The Pedestal Group, dating from 1955-56, is collection of chairs and tables made of plastic and featuring only one central leg ending organically in a round disc on the floor. The very successful Tulip Chair belonged to this group. Eero Saarinen says he wanted to abolish the “miserable maze of legs.” In 1951 he designed the Saarinen Collection for Knoll, consisting of the still popular line of Executive Chairs. These chairs transformed the notion of what executive seating could be with its sculptural form and modern finishings.